Nowadays, human beings seem to be susceptible to Modern World diseases like diabetes, cancer, depression, and especially obesity. 1 billion people in the World are obese, and American people account for 35%. Although obesity is not a disease itself, it can lead to various dangerous diseases. About 3.4 million people die each year due to being overweight and this number will increase exponentially. The reasons are obvious, the sedentary lifestyle, eating too much junk foods, and even the stress of balancing work and family might cause stress-induced weight gain. Life is hard, we need to be prepared for this. A little exercise every day can help you improve not only your physical health but also your mental health. It can help you increase physical strength, refresh your mind, detoxify the body, and ensure endocrine system, metabolic system, respiratory system, etc., operate properly. Exercise is also quite a fun stuff to do when you are boring. Committing to exercise is a ticket that leads you to a healthy and happy life. Outdoor workouts are wonderful, but not everybody has enough time and space for this kind of exercises. If you are living in a small apartment, and just have a little time after the work session, or you want to find an equipment that can make your kids and your parents interested in exercising, exercise bike would be a smart choice. An exercise bike not only makes the practice more convenient and easier but also helps users maintain the motivation. 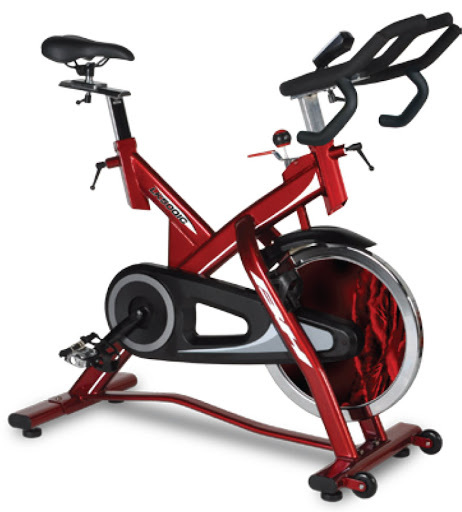 However, to choose a suitable exercise bike for your own need, you have to do a little research first due to the diversity of exercise equipment on the market. In this review, I will share my experience in choosing an exercise bike, and introduce you a good one: Marcy ME 709. 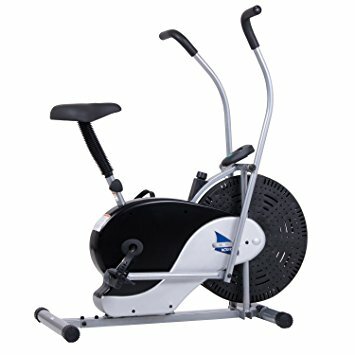 1 What is exercise bike? How many types of exercise bike? Which fits you best? 2.4 Price, warranty and some other feedbacks. What is exercise bike? How many types of exercise bike? Which fits you best? Exercise bikes are popular because they offer a full-body workout, which is not so intense and is friendly to your knee joints, fitting to long hours of practice. When it comes to this kind of endurance and slow-moving exercises, you can practice your slow twitch fibers, making the body consume a huge amount of oxygen and consequently a lot of fat could be burned. Therefore, you should choose an exercise bike, if you want to maintain a healthy lifestyle, to keep fit, or for the physical rehabilitation and physical therapy need. Although they are quite similar, each has the own advantages and disadvantages. So, let’s have a closer look to figure out which is the best for you. This kind of exercise bikes stands up like regular bikes, giving you the experience like riding a real bike, but less strain on your hip, knees and ankles. Practicing with Upright Stationary Bike is good for cardiovascular and lower body workout. It takes up less space than other bikes and the price is also affordable. This kind of exercise bikes is designed exactly similar to real sportbikes. When cycling, the rider needs to lower the body and generate a momentum that’s strong enough to balance the weighted flywheel momentum, which makes the user feel the realistic riding experience. They have handlebars moving back and forth in sync with the pedals’ movement. So, this kind of bikes helps riders in practising not only the lower body and cardiovascular but also the upper body. 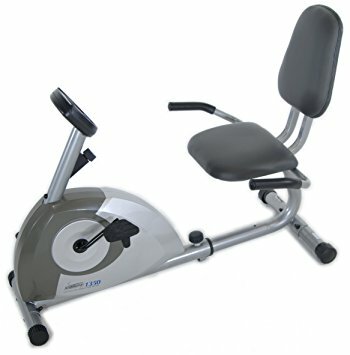 With regard to recumbent stationary bike, you would feel super comfortable and easy on your back. These bikes are might not the suitable equipment for those who want to exercise hard, but are sure the best ones for anyone who wants to maintain a healthy lifestyle, especially for kids and oldster. It is like a chair with pedals in front of the seat instead of below the seat, making you more comfortable enjoying the practice. 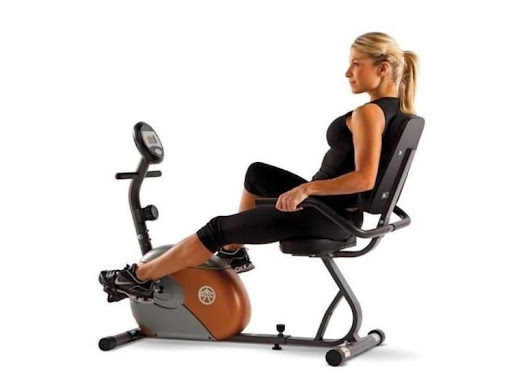 Recumbent Stationary Bikes are perfect for blood flow, cardiovascular and lower body workout. If you are a newcomer to exercise, you should choose a recumbent bike due to its interesting and easier experience. Before making the decision what bike model to be purchased, look at above and ask yourself: “Who will use the bike and What is their demand?”. For me, I prefer a recumbent stationary bike, thus, I am going to introduce you my recumbent exercise bike choice – Marcy ME 709. If you want another kind of bike, I will recommend you some at the end of this article. Marcy is the key brand of Impex. Since being established in 1982 as a manufacturer of fitness products, Impex has been developing sustainably and is now the leading health and fitness equipment provider. Impex products are well-known for its innovation, superiority and competitive price, as well as the great customer service. Impex is the main vendor of many big sporting good retailers and fitnesses with its wide-range of products and brands. Indeed, Besides Marcy, Impex has some more popular brand including Competitor, Apex and Hers. 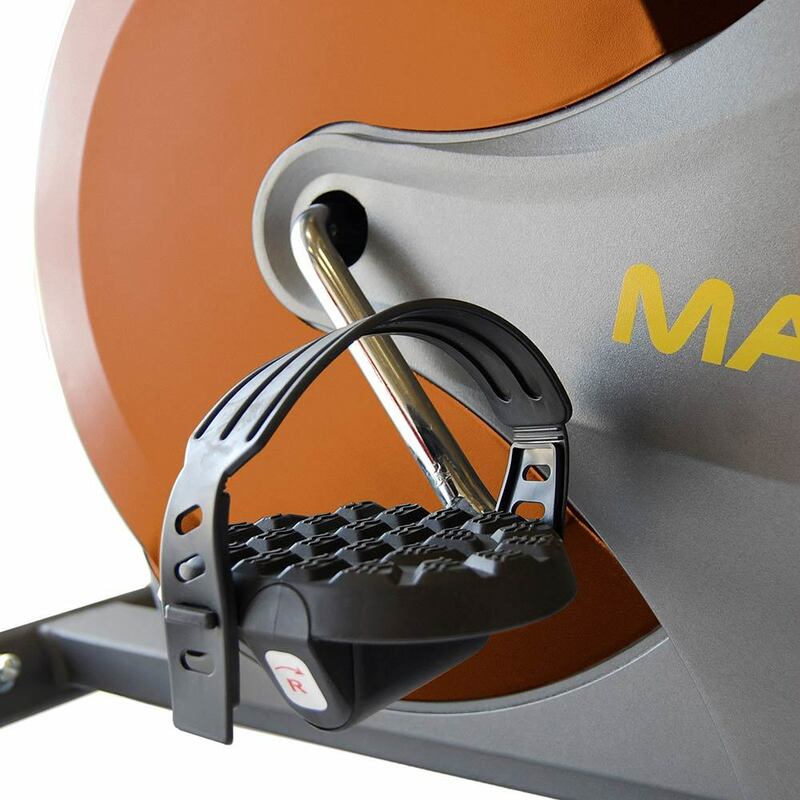 Each brand is positioned in one specific market segment of the sports equipment industry, and Marcy is specialized in home fitness equipment. 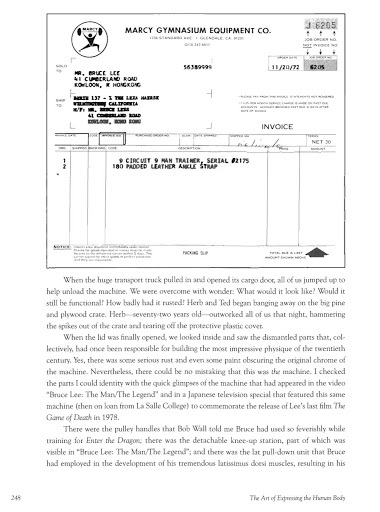 Marcy founder was Walter Marcyan, born August 24, 1913, in Chicago, Illinois. He was a successful weightlifter and bodybuilder with some records and some Olympic attendances. Late in his career, he decided to become a doctor of Chiropractic Medicine, as well as help and advocate for fitness activities. 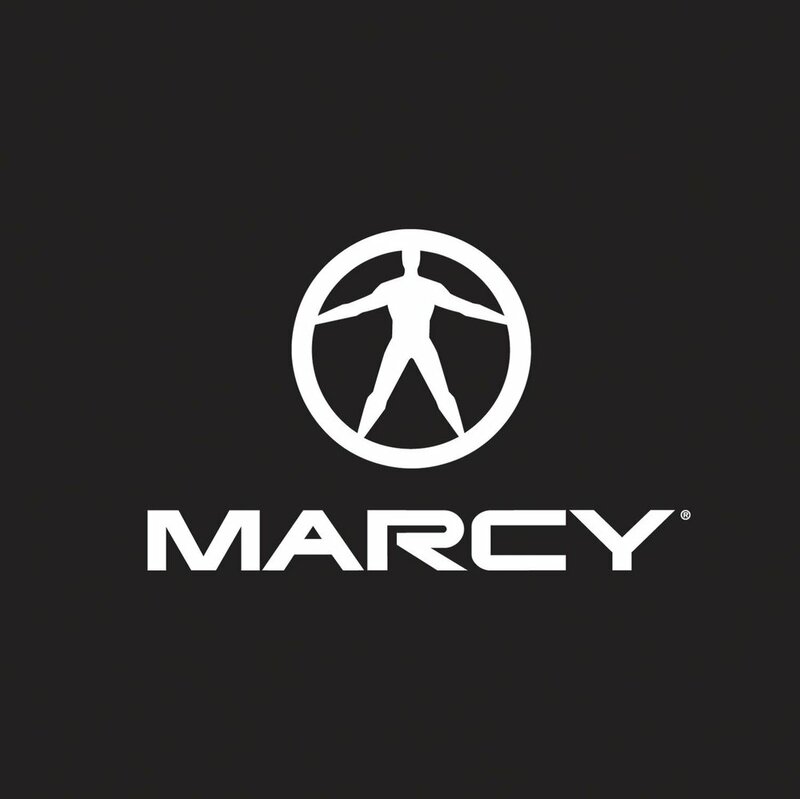 In 1946, he set up House of Health and started to design exercise equipment, laying the groundwork for nowadays Marcy brand. “The primary goal of our physical education and athletic programs should be that every American boy and girl should be stronger and healthier and that they should have attained the knowledge to maintain these blessings through later life.”, he wrote in an article. Marcy provides various home health and fitness equipment, including home gyms equipment, strength enhancing equipment, cardio exercise equipment, fitness accessories, outdoor furniture and kids playground. Marcy ME 709 belongs to the cardio category, thus you can see that Marcy ME 709 is designed especially for cardiovascular exercise. Marcy ME 709 is small and compact, suitable for small space. Indeed, The dimension is only 55.5L x 25W x 37.5H inches, which means it will take only 1387.5 square inches of your floor. When not in use, Marcy Me 709 can be disassembled to store in your closet or below your bed. Marcy ME 709 weight is 60 lbs, heavy enough for steadiness and light enough for transport. Four additional wheels ensure a kid can easily assemble and transport the bike. Although the weight is light and the size is small, Marcy ME 709 can carry up to 300lbs. Marcy ME 709 has quite a finished look with grey, black and brown powder coated steel. The back padded chair gives the users maximized comfort and ease on users’ knees and back. You can adjust the length of the chair to fit your comfort, from 40 to 49 inches. Furthermore, the foam-covered handlebar behind the seat gives your hand something to hold, securing your body, and lowering the pressure on your shoulder and back, when you are intensive practising. As mentioned above, ME 709 is designed for maximized comfort on the terms of seating position. 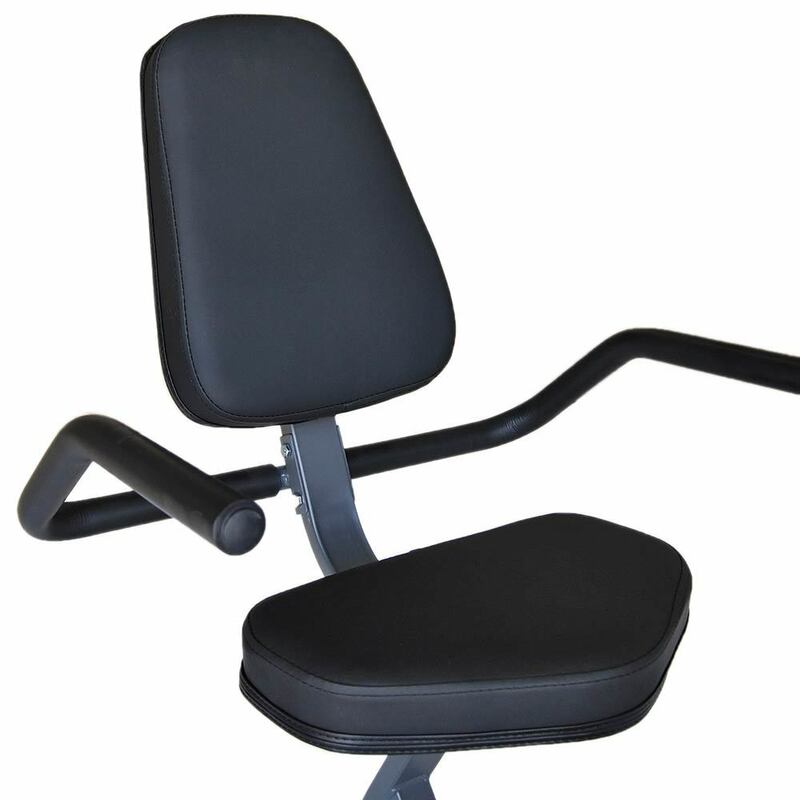 Its ergonomically designed saddle furnished with high-density foam, and its contoured foam-covered handles, not only support your arms, knees, shoulders and back but also help you maintain proper form when exercising. By maintaining proper form when exercising, you can protect you from knee injuries, shoulder and arm pains, as well as diseases of the vertebrae. People exercise for healthy life, not for incident injuries, so pay attention to your position while workout. 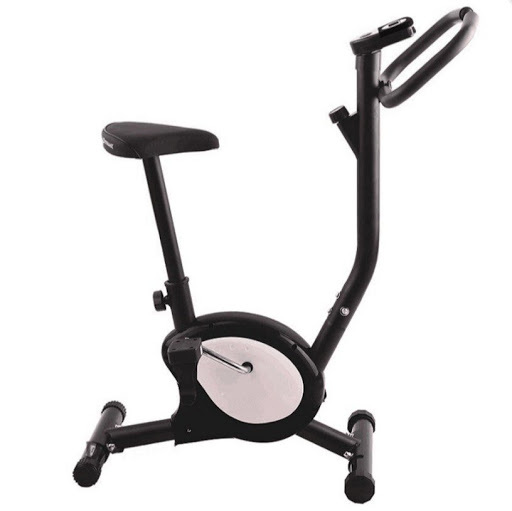 A recumbent exercise bike has the most distinctively shaped among other kinds of exercise bikes. While exercising, you may lie supine on the bike, which is very good for leg-workout. 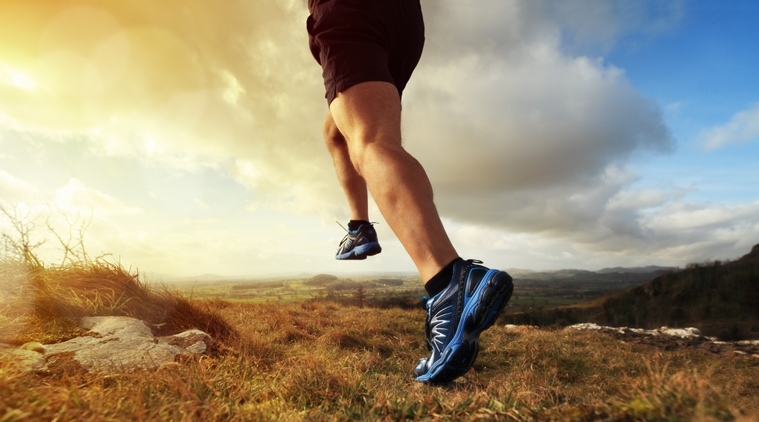 Your legs need to work harder without the support of trunk and upper body movement. Due to all the reasons above, ME 709 is also a perfect choice for those are injured or in physical rehabilitation/physical therapy treatment. At the heart of Marcy ME 709 is a heavy flywheel creating resistance and momentum, thus, your first several rotations are extremely hard. However, the more you practice the more smooth and easier the rotations become, even, you need to generate a force to slow down the speed. This resistance and momentum make it interesting and effective when practising, that keep you exercising for a long time. To create the resistance, Marcy ME 709 is featured a magnetic resistance mechanism. Comparing with another resistance mechanism – direct-contact resistance – the magnetic resistance mechanism has much more advantages. The direct-contact resistance mechanism is more like a direct contact braking system used in a real bicycle. It uses the principle of friction to generate resistance, so the system includes brake pads contacting directly with the flywheel. While this kind of mechanism has the advantage of the real-life experience, it has critical disadvantages about the noise, the durability of pads and flywheel, and the smooth experience. With all of the predecessor’s disadvantages, when the magnetic resistance mechanism was invented, it has completely dominated the market. This system uses electromagnetic induction to provide the resistance, just like the Shinkansen (super fast train, also be known as bullet train) of Japan. So, this kind of mechanism operates smooth and quiet. The components have the longer life which will save some costs for you. 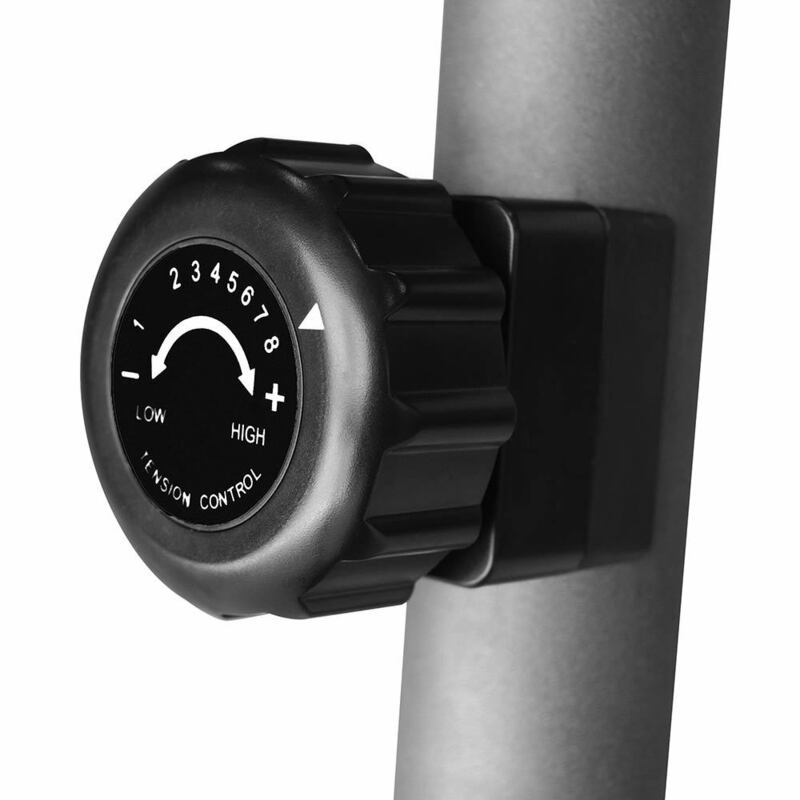 Moreover, you can easily adjust the level of resistance at a push of a button. And obviously, Marcy did not leave this strength in vain, the engineers set up 8 resistance levels within Marcy ME 709, in order to give you the fittest feeling no matter how intense you wish the exercise be. A control panel and a small screen are always in front of you while exercising. You can easily monitor your practising performance through several metrics, consisting of Speed, Distance, Time, Calories, Odometer. With this display screen, you can schedule your workout plan and easily monitor it. And the control panel makes everything convenient when you can adjust anything by your hand. Marcy ME 790 pedals are designed with additional weight and adjustable foot straps so as to enhance the comfort of users’ foot while offering ultimate control, ensuring practising experience is smooth and rhythmic. Price, warranty and some other feedbacks. 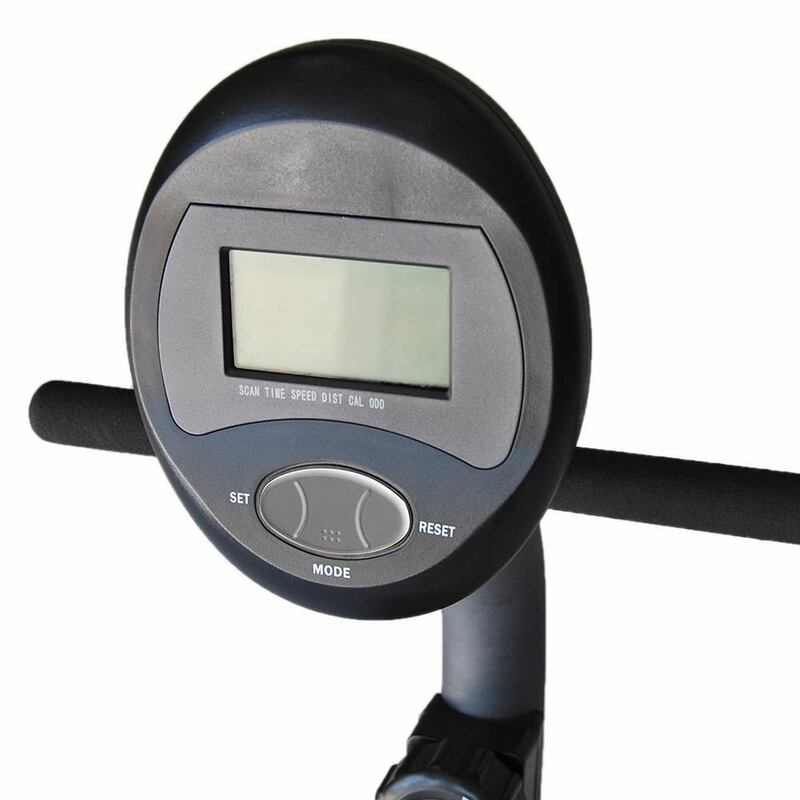 ME 709 belongs to popular market segment, while other recumbent exercise bikes are around $300 – $400, some even cost $700 and more. I know what you are thinking about, don’t worry, low price does not always come with a bad warranty. In fact, Marcy ME 709 includes a manufacturer’s 2-year limited warranty, and you also could pay $19.90 more for 3-year protection plan from the retailer. Furthermore, Marcy ME 709 has a high Amazon product’s star ratings. This index uses an AI model instead of a raw data average to give customers better information. In particular, it considers the factors like the age of a review, helpfulness votes by customers and whether the reviews are from verified purchases, to calculate the final score. In my point of view, I give this product 8 out of 10 for its good quality, extreme comfort, compact design and excellence customer service with a competitive price. Of course, there are better products in the market, I will also recommend one, in the following last section.